Hannah appeared on Show 175, recorded in March 2008, at age 16. 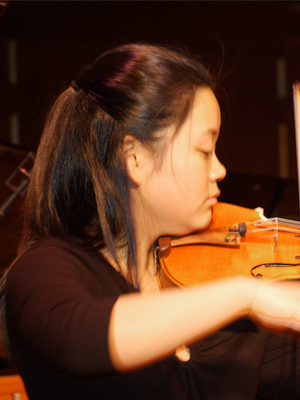 Hannah Ji (violin), 16, is a sophomore at Ridge High School in Basking Ridge, New Jersey, where she is a member of the school orchestra and choir. She attends the Manhattan School of Music in New York City on the weekends, where she plays chamber music with a quartet and performs with the Pre-College Philharmonic Orchestra. When she gets time off from her busy schedule, Hannah enjoys watching YouTube videos, spending time with her friends, and most importantly, sleeping. Haeseung is a Jack Kent Cooke Young Artist.